This, the most widely reviewed industry procedure released to date, describes in a practical manner the main steps to using a nacelle-mounted wind lidar to measure a wind turbine power curve, closely following guidelines such as IEC 61400-12-1 CD. The reviewers include experts from Siemens, DONG Energy, DTU Wind Energy, RES (Renewable Energy Systems) and Natural Power. The main aim of the peer-review process is to provide a uniform methodology within the wind industry for the measurement, analysis, and reporting of power performance characteristics for individual electricity-producing wind turbines utilising a forward-looking nacelle-mounted, circular-scan continuous-wave (CW) lidar device to measure the horizontal wind speed. Following ZephIR Lidar’s extensive experience in customer-driven power curve measurements, the turbine lidar team worked closely with the reviewers to produce a clear measurement methodology, including guidance on preparation for the campaign, data analysis strategies and quantification of uncertainty. Practicalities including reporting format for the power curve measurement were also discussed. A key capability described in the reviewed procedure is the ability of a circular-scanning CW lidar, such as ZephIR DM, to measure the wind speed at multiple points across the turbine rotor. IEC guidelines ascribe an uncertainty contribution in the wind speed due to shear effects of 2-4% when only hub-height measurements are available – i.e. from a met mast or a basic lidar system. In contrast, the uncertainty contribution in the wind speed due to shear effects is shown to be only 0.2% in the case presented within the procedure, a ten-fold overall reduction in this contribution to the uncertainty. ZephIR DM remotely measures wind speed from its installation on turbines out to ranges of 300 metres in order to inform wind studies or to characterise a wind turbine’s true potential by reducing yaw misalignment and accurately measuring power curves in free wind flow. 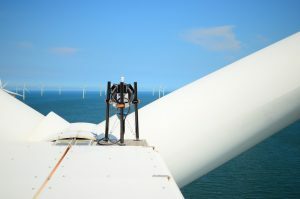 Measurements are taken across the full rotor swept diameter, rather than just at or up to hub height as provided by typical met masts and more basic turbine mounted remote sensors. Any wind farm owners / operators wishing to conduct Lidar power curve measurements should contact alex.woodward@zephirlidar.com for a detailed Method Statement.